To view 8 more pictures, interactive maps and the full, detailed description of the The Waterfront at Parkside community, please Login. Find new homes along the land that cradles beautiful Bennett’s Creek in The Waterfront at Parkside. The builder designed these family-friendly homes to keep up with today’s movers and shakers of Hampton Roads. Tucked away in an undisturbed parcel of land in Suffolk, VA, this cluster of houses makes residents feel as if they’ve moved deep into the countryside. Upon further inspection however, city amenities and military bases like Norfolk Naval Shipyard, Coast Guard Base Portsmouth and Naval Medical Center Portsmouth are not far at all. The builder of this community integrated the architecture into the natural design of the land. Here homebuyers can find new homes with scenic, waterfront views. A new home in The Waterfront at Parkside may feature custom cabinetry, tile backsplash, stainless steel appliances, ceramic tile flooring, recessed lighting, tray ceilings, concrete patio, ceiling fans, security system, garage complete with door opener, built-in storage and more. As if the lavish land wasn’t enough of a perk, the builder decided to add even more. The clubhouse is the number one spot for meet and greets. Work out at the fitness center and take leisurely evening strolls. Lounge in the pool or at the cabana on hot summer days. Let the children expend their energy at the playground and give Fido a workout at the dog park. These facilities are within arm’s reach of a serene marsh. To find new homes with all of these amenities is no easy task except when looking at The Waterfront at Parkside. Virginia is filled with salt of the earth people and simple pleasures but nowhere is that more true than in Suffolk. This city is steeped in Southern tradition but also hosts a budding folk art scene. Explore the shops, dine out and see a movie at Harbour View Station Town Center. Bennett’s Creek Crossing offers grocery shopping that is convenient too. Walk with the whole family down to North Suffolk Public Library and get that book to unwind with. If you can find new homes like these, then it must be a sign. Come check this magical land out and see all the wonders it can offer. Admire builder quality and know every homebuyer gets more than value at The Waterfront at Parkside; he gets the good life. 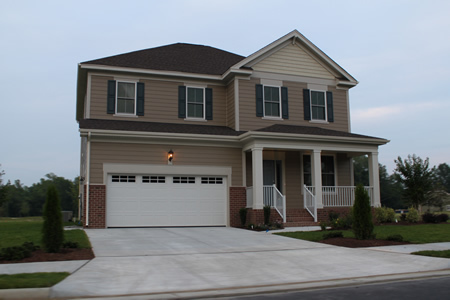 This innovative team of home builders has crafted fine residences in southeastern Virginia since 1986. These talented craftsmen bring Southern Living Custom Homes to life. Excellence is the goal with each new project. Send me more information about the The Waterfront at Parkside new home community. Our agents gladly offer FREE property tours of The Waterfront at Parkside, Suffolk and homebuyer consultations to all serious buyers.